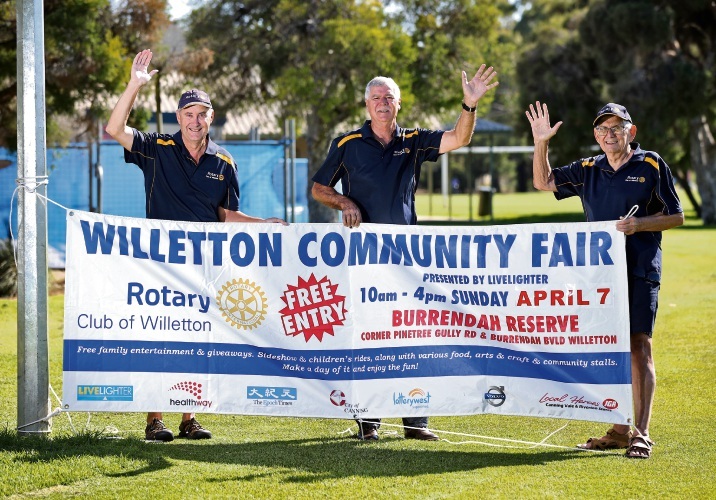 DOZENS upon dozens of community groups, family-friendly attractions and a variety of food and drink vendors are set to descend on Burrendah Park for the annual Willetton Rotary Community Fair on April 7. The fair will feature more than 160 stalls, run by a range of organisations, from major bodies like WA Police and St John’s Ambulance to local community groups like Operation Christmas Child and Rostrata Family Centre. Rotary Club of Willetton president Rob Webster said the fair was a special event because it brought the entire community together. “It’s not just to raise funds for the rotary club, it’s about providing a showcase for the community clubs to tell people what they do,” he said. Fair chairman Simon Cubitt said it was one of, if not the, largest community fairs in the southern suburbs and the club worked hard every year to ensure it was a memorable day. There will be plenty of entertainment options on the day, with on-stage performances running from 10am-4pm, while plenty of food and drink options will be available.